by Andrea Semplici, published by Terre di Mezzo. Endless stretches of salt, lakes with psychedelic colors and active volcanoes: this land, which is constantly changing, is heaven and hell together – an ancestral place where you can still watch the phenomena that gave rise to the world. 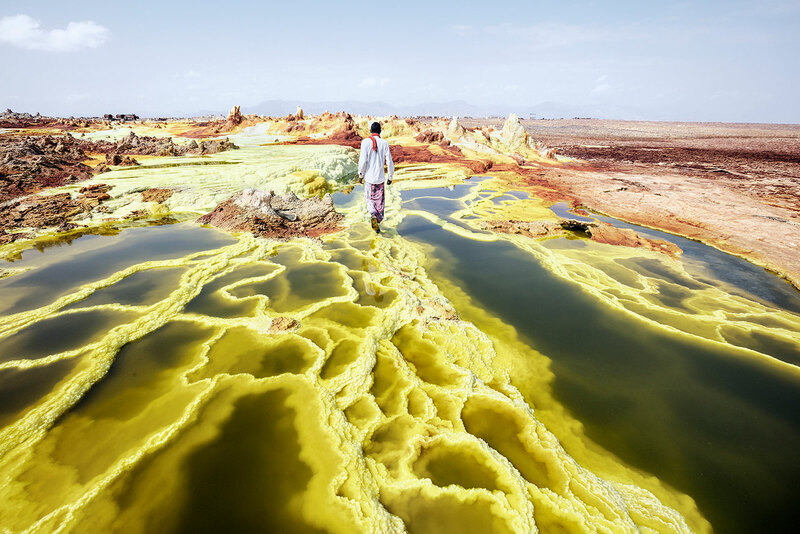 Located in the northern part of the Afar’s Triangle, which takes its name from the nomadic people who live there, the vast Danakil depression is the place where the constantly expanding of three tectonic plates join together, close to the border area among Ethiopia, Eritrea and Djibouti. This land made of re, salt and lava close to the Rift Valley – the long breach that bisects the continent – is a ghost ocean. It is from the retreat of the sea, evaporated twenty- thousand years ago, that the Danakil has gained its peculiarity: to be a spread of evaporitic rocks that gives rise to the Great Plain of Salt – a desert which stretches for about 600 kilometers. This is one of the most vulnerable places of our world: the re is just below our feet, ve kilometers away. There is a crust that is subjected to stresses of all kinds, a part of the planet where you feel the throbbing heart of the Earth. In this vast plain, the Afars’ huts built with mud and twigs appear like a mirage. These nomads, who are mainly devoted to the extraction of minerals, live in one of the most inhospitable places on earth, the hottest inhabited place in the world, with very little vegetation and temperatures that can reach 120°F degrees. The Afar people seem to have appeared from nowhere. They have kept a strong identity without having a testimony to their story. Their economy was, and is, precarious. They are nomads struggling with the hostility of the climate. They have adapted to survive in a harsh and impossible land.